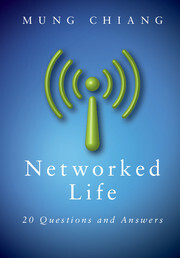 Mung Chiang is the author of Networked Life (2012). Chiang is a Professor of Electrical Engineering at Princeton University and Director of the Princeton EDGE Lab. He has received the IEEE Kiyo Tomiyasu Award and a US Presidential Award for Scientists and Engineers, for his research on networking. A co-founder and advisor to several startups, he also received a Technology Review TR35 Award for his contributions to network technology innovation and is a Fellow of the IEEE.